Today we’re kicking off a new series. A historic moment! 😀 Just like the new men’s skincare series I started in December, this series is meant to demonstrate that today’s clean beauty totally lives up to any modern lifestyle. And you are always welcome to suggest more styles in the comments! Whether you darken your style occasionally or are a genuine creature of the night, pale-as-the-moon foundations and lipsticks as black as the night can be tox-free and amazing. Veganism is strong with the dark ones, and most picks you’re about to discover are in fact vegan-friendly. There are several formulas though that contain certified organic beeswax but I include them because they are otherwise exceptional. All products are free from conflict palm oil (kernel) derivatives. While the creamy foundations by Kjaer Weis and RMS Beauty provide a luminous finish, the mineral foundations can help you achieve a quite matte one. Personally, I love to use the Certified Organic Cream Eye Shadow by Inika as a very pale and natural-looking highlighter (while it’s also great as an eye shadow or even as an eye shadow base, its highlighting power is amazing). 1. Kjaer Weis, Cream Foundation in ‘Lightness’, 61€, refill 32€ (contains certified organic beeswax). 2. Hiro, Mineral Foundation SPF 30 in ‘Porcelain’, 33€. 3. RMS Beauty, “Un” Cover-up in ‘000’, 36€ (contains certified organic beeswax). 4. Inika, Baked Mineral Foundation Powder in ‘Grace’, 39€. Everyday Minerals, Foundation Semi-Matte Base in ‘Fair 0N’ (5), ‘Golden Fair 0W’ (6), ‘Rosy Fair 0C’ (7), 19€. 8. Inika, Certified Organic Cream Eye Shadow in ‘Pink Cloud’, 25€. Lily Lolo, Mineral Foundation LSF 15 in ‘China Doll’ (9) and ‘Porcelain’ (10), 20€. Don’t get me wrong: gothic beauty isn’t confined to blacks. In fact, there are styles based on pastels, neons, there are Steampunk styles that all demand a good amount of colour. But this would lead too far for the intention of this post – if you like, we can explore the variety of gothic styles further down the road; just tell in the comments. However, it’s the edgy smoky eyes, the bold winged eyeliner make-up, dark lips and dark claws that draw the attention of the public as the most iconic gothic style. And we’re not here to disappoint, are we? 1. Sante‘s NaTrue-certified Lash Extension Liquid Eyeliner is available in two glossy, shimmering shades ‘Black Diamond’ and ‘Black Saphhire’, each 17€. Read on here -> for a more detailed review of ‘Black Sapphire’, an inky, blue-black. 2. Und Gretel‘s BDIH-certified Wint Mascara is available in ‘Darkest Black’ and ‘Chestnut’, each 34€. Both shades are very saturated; to see how ‘Chestnut’ performs against two other organic mascaras, read Product Battle: Organic Mascaras. 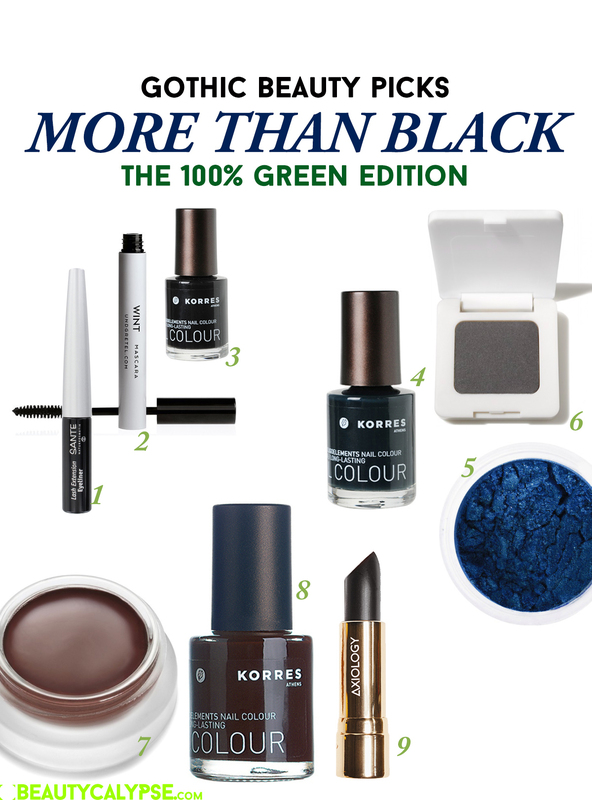 My to-date-favourite “free-from” nail polish formula comes from Korres. Try Oligoelements Nail Colour in ‘101 Black’ (3; also check out the shade ‘100 Precious Black’ with silvery shimmer), ’73 Blackened Green’ (4) or ’69 Dark Brown’ (8), approx. 9€ each. with an in-depth ingredient check. 5. PHB Ethical Beauty, Mineral Miracles Eyeshadow in ‘Midnight’, 17€; see the eyeshadow worn both as eye shadow and eyeliner (wet application) in End of Summer Beauty. 6. RMS Beauty, Swift Eye Shadow in Twilight Madness, 22€. 7. This is a cult product in a cult colour – RMS Beauty, Lip2Cheek in ‘Diabolique’, 36€ (contains certified organic beeswax). 9. Organic, tox-free and vegan-friendly, Axiology are causing much excitement in the green beauty world with their Natural Lipstick that comes in an array of shades from natural to edgy, like the shimmering black ‘Existential’, 27€. 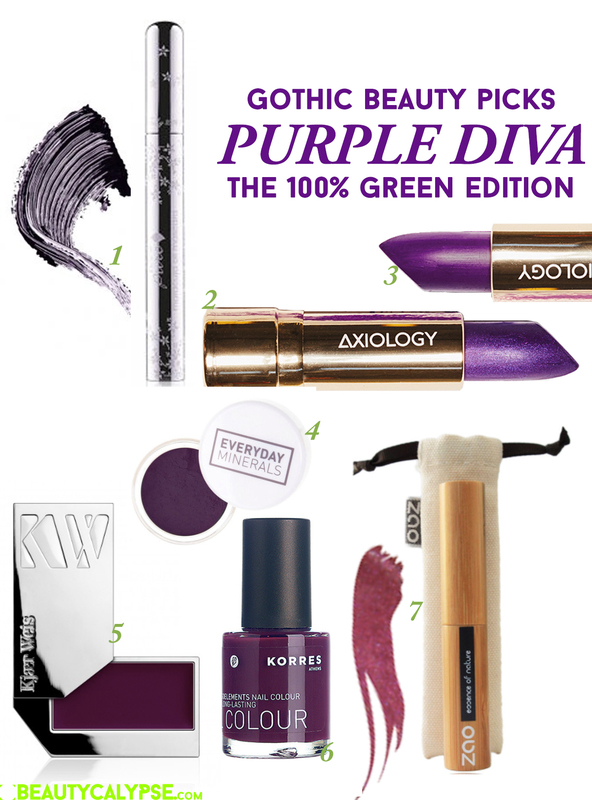 Shades of purple, burgundy and dark red are so much more enticing than a classic red lip… Okay, so maybe I’m biased, erring on the darker side of the twilight myself. But just look at these most gorgeous vampy shades and tell me you are not seduced? 1. 100 % Pure, Maracuja Oil Mascara in ‘Blackberry’ (also available are: ‘Dark Chocolate’ and ‘Black Tea’), approx. 25€. 2. Axiology, Natural Lipsticks in ‘Desire’ and ‘Reflection’ (3), 27€ each. 4. Everyday Minerals, Eyeliner in ‘Purple Rain’, a matte, highly saturated purple; also available are: Nights on Broadway (matte, highly pigmented black), Cinnamon Street (matte, soft brown) and Green Leaves of Summer (a matte, muted olive green), each approx. 12€. 5. Kjaer Weis, Lip Tint in ‘Beloved’, a rich and flattering blackberry shade, 39€ (contains certified organic beeswax). 6. Korres, Oligoelements Nail Colour in ’24 Purple’, approx. 9€. 7. Zao Beauty, Liquid Eyeliner in ‘Metallic Plum’, approx. 19€. How exactly it came to be that the earthy, raw Patchouli scent is so closely attributed to the goths as it is to the hippies, history knows several versions of, and all sound equally random to me. Patchouli lovers say it’s mysterious, and I’ll spare you the comments of patchouli haters. Just like Vetiver or Rose or Frankincense, Patchouli is divisive. I’m partial to such perfumes that manage to refine the wild Patchouli notes and instead, present us with the beast still proud and glorious yet lovingly tamed. 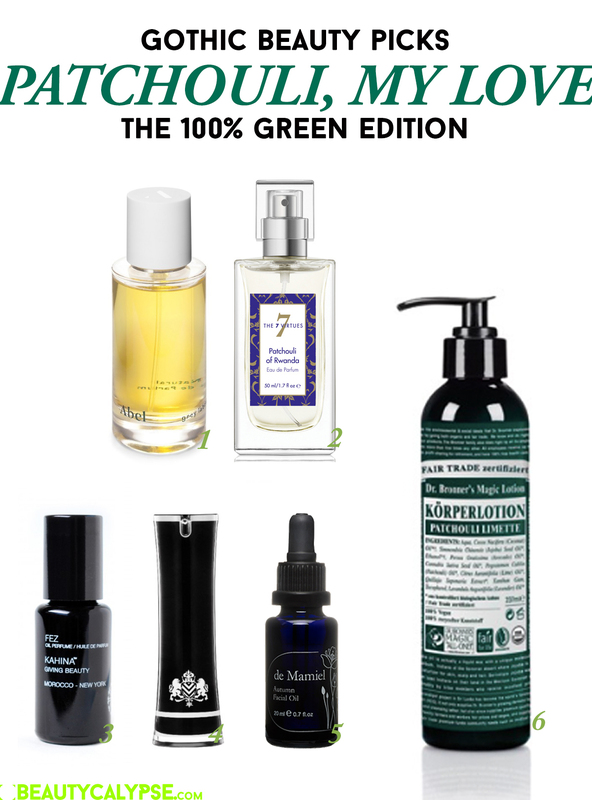 Products presented here are both perfumes and skincare – isn’t it great news for the Patchouli aficionados? 1. Abel Odor, Grey Labdanum – regal, impressive, on the “masculine” side of the fragrance spectrum – is completely organic as are his delightful siblings; 50 ml 98€ (travel size of 15 ml approx. 45€). 2. Patchouli is made modern, striking, effervescent and seductive in The 7 Virtues‘ Patchouli of Rwanda. Reviews & interviews, THE 7 VIRTUES. 3. By contrast, Kahina Giving Beauty, Fez Perfume Oil, 85€, is utterly dark, spicy and intense. Essential oils of rose and orange blossoms, vetiver, ylang-ylang, cumin and clove glow in the base of jojoba seed oil. Moving on to skincare with 4. Vestige Verdant‘s equisite Rare Oil Blend, 59€, a rich blend of argan, neroli, sea buckthorn, patchouli and carrotseed oils designed to moisturise and to regenerate skin. 5. De Mamiel Seasonal Autumn/ Winter Facial Oils, approx. 88€ each are available only in Autumn and Winter respectively and harness the power of patchouli to create season-appropriate skin delights. 6. And let’s finish the gothic beauty picks with a gorgeous body moisturiser by Dr. Bronner, the lush, fully vegan Organic Body Lotion Patchouli Lime, 237 ml approx. 15€. 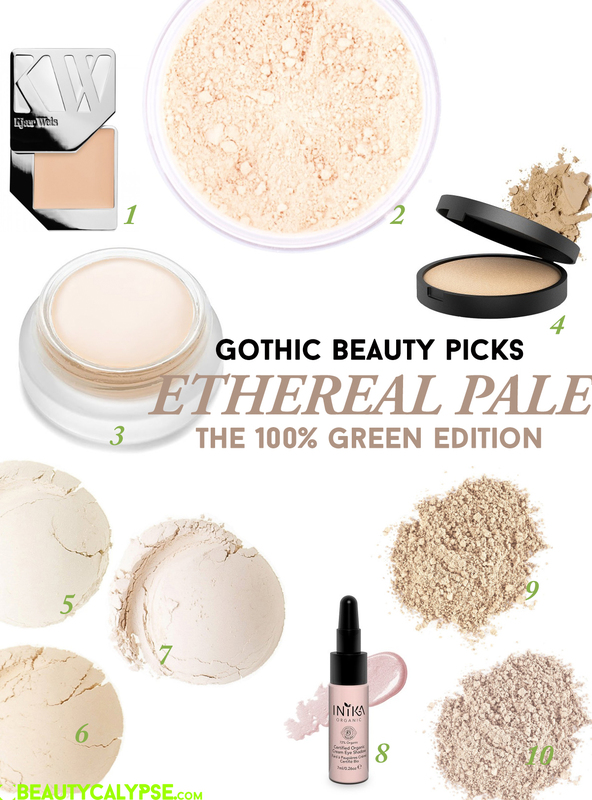 So, did you enjoy the GOTHIC BEAUTY green picks? Share your personal gothic moments in the comments below! Hi Sheryl, they either don’t use any or they don’t use conflict palm oil or ingredients derived thereof. This is something that’s non-negotiable for me. Thank you for visiting! As always it’s a great selection. For me personally I like the pale options the most, but would top it with Blackberry mascara. Looks adorable. I really liked your Instagram teaser for the post! Definitely worth to check your profile on a regular basis for more inspiration. 💚 Thank yooooooou!… *happy dance* You should try this mascara sometimes. Terrific, and the smell is so pleasant. I like make-up that smells nice. This is so beautiful! You look great as a Goth!